Bitcoin: What’s behind the gold rush? The Internet world’s newest craze are bitcoins. It’s been nine years since this digital currency was born. It has gone through many ups and downs, just like any other currency with physical money. Here’s a BBC article on the bitcoin goldrush – what it is, how does it work, and who’s behind it? The value of digital currency Bitcoin is making headlines again. 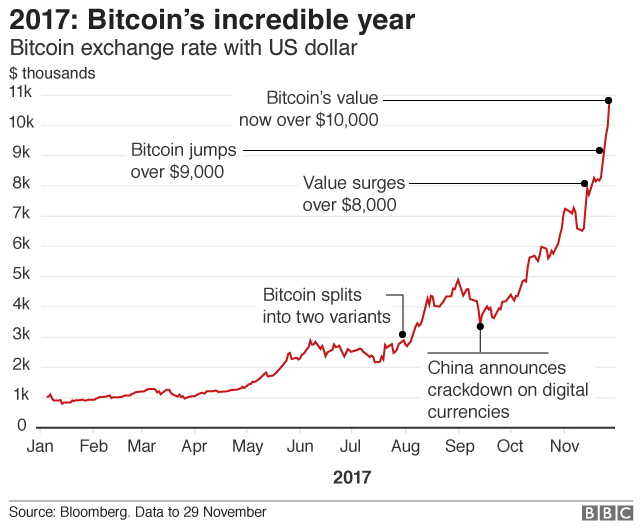 Amid volatile trade at the end of November, it hit a peak of more than $11,000 (£8,200) at one point – a staggering rise, given that it started the year at $1,000. So what exactly is Bitcoin, and what’s behind the buying frenzy? Unlike the notes or coins in your pocket, it largely exists online. Although there are some specialist ATMs which issue bitcoins, it may be best to think of them as being more like virtual tokens. And secondly, Bitcoin is not printed by governments or traditional banks. That means it is “not legal tender, you can’t pay your taxes or use it to settle debts”, says Dr Garrick Hileman of the Judge Business School at University of Cambridge. Bitcoins are created through a complex process known as “mining”, and then monitored by a network of computers across the world. There’s a steady stream of about 3,600 new bitcoins a day – with about 16.5 million now in circulation. However, like all currencies its value is determined by how much people are willing to buy and sell it for. Why has it gone up so much this year? No one is entirely sure. Some say it’s a classic economic bubble: frenzied investors paying far more for an asset than it’s worth for fear of missing out. They put it in the same bracket as the mania for Dutch tulip bulbs in the 1630s or internet companies in the dot.com boom. Others point to the growing prospect of Bitcoin crossing over into the financial mainstream. “Speculation is a big part of this, but there are signs of growing use,” says Dr Hileman. He says there were between three and six million people around the world actively using crypto-currency in April. “Today it’s probably closer to 10 to 20 million, so it’s a very quickly growing user base,” he says. That’s the equivalent of a population the size of the Netherlands or Chile. There has also been a boost by some large financial institutions, like the owner of the Chicago Mercantile Exchange, getting into the space, he adds. How do people buy Bitcoin? There are now thousands of different crypto-currencies, but Bitcoin is still the best-known. To receive a bitcoin a user must have a Bitcoin address – a string of 27 to 34 letters and numbers. This acts as a kind of virtual postbox to and from which the bitcoins are sent. There is no registry of the addresses, which enables some Bitcoin users to protect their anonymity. Bitcoin wallets store the addresses and are used to manage savings. They operate like privately-run bank accounts – with the proviso that if the data is lost, so are the bitcoins owned. Increasingly, users are often asked for ID to open a wallet. The rules underpinning Bitcoin say that only 21 million bitcoins can be created – and that figure is getting ever nearer. It is unclear what will happen to the value of bitcoins when that limit is reached. Can they use bitcoins to buy things? The anonymity afforded by digital currencies has attracted people wanting to make illegal purchases on the internet. However, a small but growing number of recognised businesses now allow customers to buy goods and services with Bitcoin. They range from multinational firms like Microsoft and travel booking site Expedia, through to small businesses using it as something of a novelty, such as a sushi restaurant in Cambridge or an art gallery in London. It is not the same as established currencies, like the US dollar, which can be used across the world to buy a coffee or pay for a hotel room. A 900% rise in one year for a traditional currency would have major repercussions for consumers’ spending power and the businesses that accept it. But many Bitcoin owners don’t use it to buy things. “The vast majority of users – I would estimate upwards of 80% or 90% – get into the space for investment reasons,” says Dr Hileman. What concerns do regulators have? At the moment Bitcoin is largely unregulated, says Bradley Rice, an expert in financial regulation at the law firm Ashurst. It has been widely used on the dark web, which cannot be accessed via a normal internet browser without using a workaround. There are also concerns about its volatility. 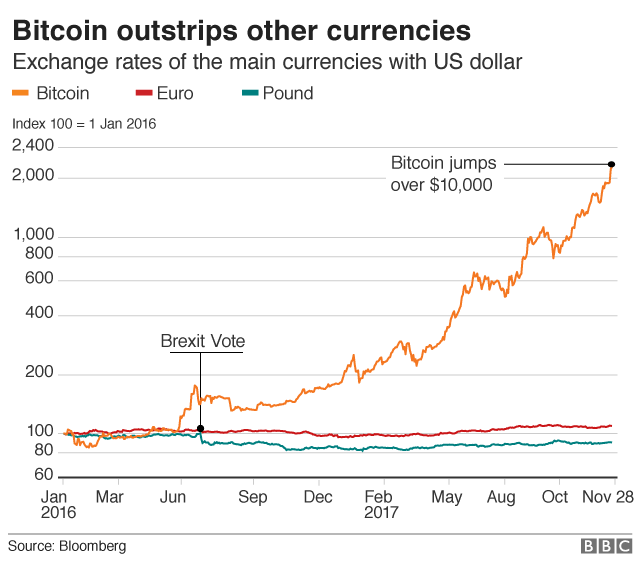 The chart below compares Bitcoin to the pound and euro. All the values start at 100 to compare the currencies more clearly. Because of Bitcoin’s much faster growth, the chart uses a different approach on the y-axis where the smaller the gap, the faster the increase. China and South Korea have serious worries. They have banned any new virtual currency launches and have been shutting down exchanges on which they are traded. But the underlying technology of Bitcoin is regarded by some major financial institutions as bullet-proof. “That’s potentially why financial regulators [in Europe] are adopting largely a ‘wait and see’ approach,” says Mr Rice. Is it all a bubble? There is no shortage of financial journalists or experts saying Bitcoin’s surge is a bubble. 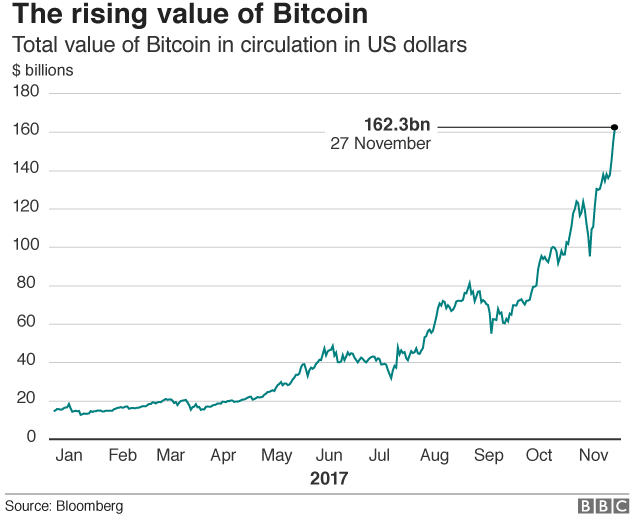 Bitcoin has doubled in value in the space of a month – which has led some to argue it is too volatile to be seen as a currency, and warned that a crash is inevitable. However, Bitcoin has been “declared dead” a few times already, says Dr Hileman. “It’s shown some resilience and bounced back from some near-death experiences,” he says. At the same time, many would agree this is “very bubbly”, and he predicts we may see a “spectacular crash again in the not-too-distant future”. “So hang on tight if you are a holder of these currencies,” he concludes.